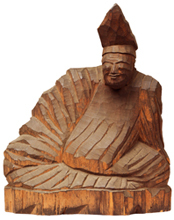 Enku (1632-95) was a Buddhist monk and sculptor who is said to have carved 120,000 Buddhist statues in his lifetime while making pilgrimages to sacred mountains all over Japan. 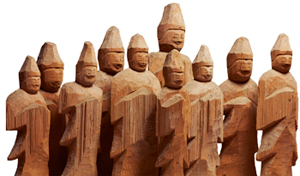 Using wood from forests in the places he visited, Enku readily created Buddhist statues. 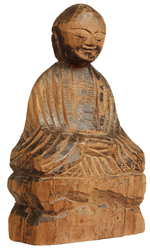 Many of his statues are unpainted and clearly show knots in the wood as well as places where the wood was chopped or chiseled. 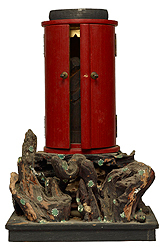 Conveying the wood’s vitality, Enku’s unostentatious statues of Buddha were favored by villagers from the Edo period (1603-1868) onward, and even today they attract many admirers. 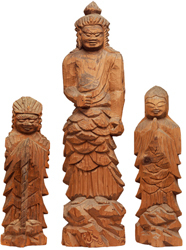 This exhibition introduces 100 Enku’s statues from Takayama City in Gifu prefecture, with a focus on 61Enku's statues from Senkouji temple, including the Seated Ryomen Sukuna, a prized statue of a two-faced deity. There are also statues with the inscribed names of mountains Enku climbed, including Mount Hotaka and Mount Norikura. Standing like trees in the exhibition room, Enku’s statues evoke the atmosphere of Hida’s forests. * Advance tickets will be sale at the Museum ticket office (during museum hours, 30 minutes before closing hour), e-Ticket Pia (P-code:765-365), Lawson Ticket (L-code:31632), E-Plus and other major ticketing agencies from Monday , Octorber 1, 2012 to Friday, January 11, 2013. * Special exhibition "Wang Xizhi: Master Calligrapher" (Tuesday, January 22 - Sunday, March 3, 2013, Heiseikan) requires a separate admission fee.